Maraming Pinoy at OFW sa Macau at sooobrang nakakataba ng pusong matawag at tumawag ng "Kabayan!" really proud to be a Filipino. Til I see you again, Macau! Last edited by uzumaki on Tue Jan 15, 2019 3:15 am, edited 1 time in total. Miss France Tourism 2018 latest photoshoot. Last edited by uzumaki on Tue Jan 15, 2019 3:14 am, edited 1 time in total. The girls still reminisce their time at the pageant. This year was undoubtedly the best year of my life! Thank you 2018 for all the opportunities and doors you opened for me. 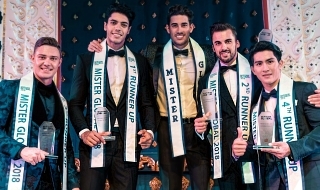 I had to represent Portugal in @misstourisminternational competition in Malaysia, it was a unique experience where I gave my best to be proud of my country! (I.e. Thank you to the organization @ miss.portuguesa for this opportunity, for the vote of confidence and for all the support. It is a pride to be part of the family. Now it is with strength and courage that I enter 2019 in search of new achievements! I want to thank the Leiria @slimnoivas store for sponsoring me with this beautiful dress I wore at the final gala. A big thank you to all who supported me on this great walk and happy 2019! Two of the 3 Bs: #Basketball x #BeautyPageants. Repost from @theqrownph: "LOOK: Last night was the opening of the 44th season of the Philippine Basketball Association or PBA at the Philippine Arena in Bocaue, Bulacan where aside from our favorite basketball teams, people were excited who will be the muse of this different teams. Some of the muses are celebrities, some of them are athletes and some of them are beauty queens! Who stood out the most in this group? Comment down below! Chose to wear a Maguindanaoan traditional wardrobe and Lumad headdress for the launching event of Miss Tourism International held in Macau. Beautiful creation by Edwin Uy. Thanks to the invitation of the Maimei Group, I look forward to entering the Middle East next month. Exactly 10 years back on 31/12/2008 I won @misstourisminternational in #Malaysia. Some people ask me if beauty pageants are still relevant in today's times.. I feel pageants are constantly evolving and are much more than just about beauty. Some very successful women in entertainment, business and politics have been beauty pageant winners. 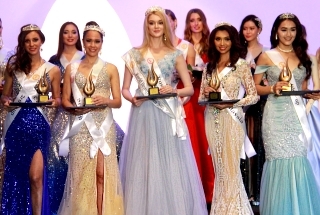 Pageants are a great platform for women to showcase their potential and launch themselves in any direction they want. - Manasvi Mamgai, Miss Tourism International 2008. 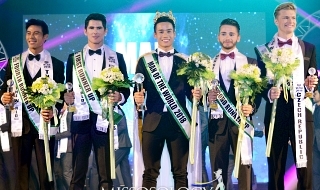 We all know the back-to-back victory of the Philippines in Miss Tourism International courtesy of the late RIZZINI ALEXIS GOMEZ (2012) and ANGELI DIONE GOMEZ (2013). But unknown to some, it was MARIA ESPERANZA MANZANO who clinched our first MTI title way back in 2000.
uzumaki wrote: We all know the back-to-back victory of the Philippines in Miss Tourism International courtesy of the late RIZZINI ALEXIS GOMEZ (2012) and ANGELI DIONE GOMEZ (2013). But unknown to some, it was MARIA ESPERANZA MANZANO who clinched our first MTI title way back in 2000.